My book has just gone to print. Routledge did a very nice job on the cover…with thanks to Andrea Ø. Ofstad for the cover image of a Spanish slug (Arion vulgaris), first spotted and formally identified in Britain 2012; they probably arrived on imported salad.. The third and final workshop in the Unexpected Encounters with Deep Time series, organised by the Edinburgh Environmental Humanities Network. The workshop will be accompanied by a public keynote lecture from Prof Steven Hartman, title tbc, at 6pm on Tuesday 19th April. Ghosts are, perhaps first and foremost, expressions of desire: to connect, communicate, or commingle across boundaries. One of the most challenging aspects of the Anthropocene—both conceptually and ethically—is the way it puts the present in contact with distant times (past and future) beyond the scope of human experience, or even imagining. The time we live in is, in this respect, very much out of joint. This workshop, the final in our series of discussions of ‘unexpected encounters with deep time’, will take the figure of the ghost as an index of this disjunctive time, as a way of thinking about the connections between deep pasts and deep futures that reside within the everyday. Much recent work in the Environmental Humanities has considered the implications of the uncanny time of the Anthropocene, from the multispecies and geologic genealogies of (respectively) Deborah Bird Rose and Kathryn Yusoff, to the urging of the distant ancestor (Nigel Clark) and the ghost of the unborn (Timothy Clark) that disturbs the unilateral excesses of contemporary (capitalist) ‘presentism’. The conceptual frameworks in play have been equally diverse, from Derridean hauntology to indigenous worldviews, and the example of Holocaust studies. This strand of the ‘Unexpected Encounters’ series will consider this equation of haunted time with ethical time, and how the spectral can complicate our ways of thinking and describing the enduring presence of deep time. As the final workshop in our series of discussions of ‘unexpected encounters with deep time’, Haunting will allow us to both develop new lines of thought, and to revisit the scenes of Enchantment and Violence explored in our previous workshops. Haunting is suggestive of both the impress of the fantastic upon the real (‘conjuring’ ghosts), and of the potential for acts of violence or rupture to echo into the present (and beyond); therefore this final strand will allow for a useful examination of how all three strands in our series interact. • How might the ghostly help us to think about the connections that exist between apparently very distant times and states of being? • The ghost is also the one who endures. What kind of change in perspective can we achieve by knowing ourselves as the ghosts who will endure in the dark ecological futures inaugurated by our collective actions? • In what ways can non-Western traditions of the spectral or supernatural help our understanding of the haunting presence of deep time within the everyday? • What forms of ‘uncanny ethics’ (multispecies; intergenerational) emerge in these haunted temporalities? • In what ways can we productively reappraise the value of melancholia, espoused by Timothy Morton’s ‘dark ecology,’ in shaping a viable response to the Anthropocene? Papers addressing these and related questions are very welcome. Please submit your proposal by email to david.farrier@ed.ac.uk, by the 11th of March. Responses will be provided by the 18th of March. Proposals for alternative presentations/formats are welcomed..
via Call for Papers: Unexpected Encounters with Deep Time: Haunting | Edinburgh Environmental Humanities Network. There is a one in 59,000 chance – give or take shifting orbital trajectories – that asteroid 2015PU228 will collide with the Earth in the year 2081. Heavy and fast-moving, PU228 was likely shunted into its present orbit by a collision several million years ago. According to the European Space Agency, the asteroid poses ‘no unusual level of danger’ – after all, the chances are 99.9983% that it will not hit Earth. Even so, PU228 reminds us that the Earth is not a closed system, but is vulnerable to cosmic events, thus drawing us into a deep time perspective. Yet deep time is not singular, and intersects with vulnerability and violence in multiple ways. The scale and speed of environmental change, for instance, as forests are cleared, hormones disrupted and food webs collapse, overwhelms the adaptive capacities of many nonhumans; we can see the unravelling of ancient Earthly biographies all around us. More broadly, the geo-social formations that cause and suffer climate violence are not evenly distributed, but follow sedimented lines of imperial, racial and other inequalities. Closely related, petro-violence proliferates as different groups – from corporate behemoths to apocalyptic jihadists – profit from fossilised stores of energy laid down in deep time. Current world disorders also interact with the deep time of viruses: the high mutation and replication rate of Ebola allows it to evolve extremely rapidly, while avian flu strains also evolve at increased rates in the bio-techno-cultural incubators of the globalised poultry industry. These and many other kinds of violent encounters with deep time provoke different responses, from fear to mourning, from turning away to impassioned intervention. Assessing different responses to violent earthly/cosmic forces that precede or exceed human capacities. “Love is evil!” quips Zizek. How can we deal with the fact that violence inheres in acts of love and care, and how much collateral violence can we tolerate in making valued life live? How to transform existing, unjust geo-social formations? How might divine violence, revolution, or other forms of politics confront the politics of deep time? What wounds does deep time inflict on thinking itself? What comes after blood has been spilled – reconciliation, mourning, or mopping up? What happens when different temporalities collide? How can we theorise the violence of deep time as banal, systemic, indifferent, symbolic, bodily, or cosmic? Papers or interventions of any kind (for 30 minute slots) addressing these or any related questions are welcome. Please submit your proposal by email to the addresses given below by 18th January 2016. Responses will be provided by 20th January 2016. Proposals for alternative presentations/formats are welcome. Please contact the organisers to discuss. via CfP: Unexpected Encounters with Deep Time: Violence | Edinburgh Environmental Humanities Network. Papers of around 15-20 minutes addressing these and related questions are very welcome. Please submit your proposal by the 19th of October using our online form. Responses will be provided by the 26th of October. Proposals for alternative presentations/formats are welcomed. Please contact the organisers to discuss. Source: Ginn F and Barber J 2015 FF: “ACA/GEO/21/IBG/CONF/2015/TEMPORAL-ANXIETY/BG-JL-KY/FF” | Society and space. Our analysis of this peculiar item can be found here. via MSPs and Nobel Laureates join Fossil Free Occupation, Edinburgh Uni | Bright Green. A student sit-in on the street outside the occupation today. The University have hired private security to block access to the building. Image: Ric Lander. 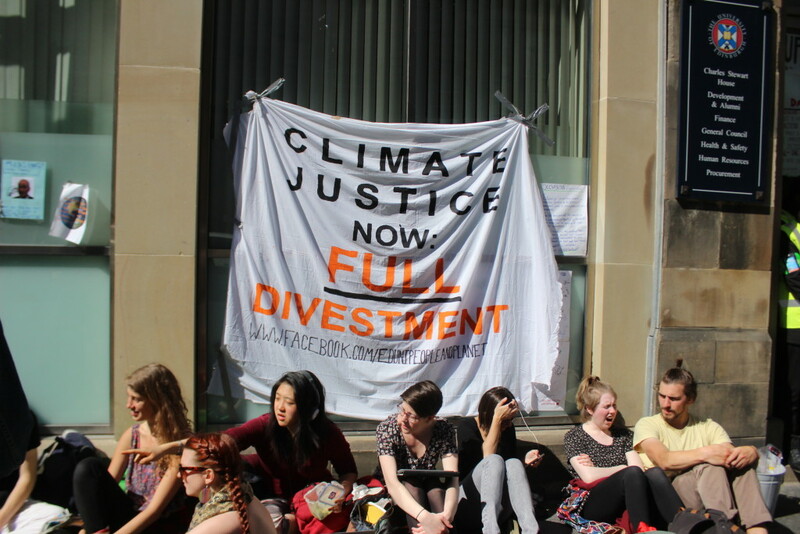 After seven days at least 40 students are still occupying a central management building in protest at Edinburgh University’s announcement last week that it would not divest its holdings in fossil fuel companies. The occupation was visited today by John Finnie MSP, member of the Scottish Greens, and Director of WWF Scotland Lang Banks. Alison Johnstone MSP and Greens Co-convenor Maggie Chapman have also spent time with the occupation, as has Nobel Prize winning economist Professor Graciela Chichilnisky (all pictured below). Place can be like a broken tooth – it can demand response, and draw the writer in. Bearing witness or giving voice or to the animals, memories, or geotic powers that animate place is a popular goal for place-writers. Good place writers are aware of the risks of misrecognition – of getting writing wrong – that inevitably come with attempts to represent these powers. Writers persevere nonetheless, and can play with the risks of getting things wrong in their writing. Good writers will also beware the implicit dominances of writing about place. Writing for the world assumes a hierarchy that may not be present in writing with or of the world. The place-writer attends with care to their own presence in the text. Our group preferred writers who avoided hubris and steered clear of self-aggrandisement. While one can write in the first person, one should not write ‘about me’: place should be written through the author, rather than being about the author. The writer thinks about how their voice will travel. Writing words to be read is not the same as writing words to be heard – attend the difference, push at the edges of legibility with wild experimentation. Think about the rootedness of accent, approach, vocabulary; how can the writing make the specificities of lived place travel? Recently, writers have expanded the traditional tonal range of place-writing with melancholia, domestic rapture, nostalgia, and more. We might widen the list to include sentimentality, speculation, sarcasm, comedy – depending on the place itself. Straining for novelty can be a drag. We felt that genre and convention are not always restrictions to be overcome: they can be enabling, as well as constraining. Hybrid writing that combines, say, an academic with a lyrical place essay, is not always desirable. The most powerful writing can often be stylistically or formally conservative (just think of a seminal journal article in your field). Hygiene can be helpful! There can be something indecent in extracting academic transcendence from a story (that moment when we go “academic” or “analytic” and away from the place). The need to meet the expectations of academics trained to read and react in certain can be restrictive. Several writers spoke of the “sinuous essay”; an essay that weaves large and small, near and far, insight and detail. The sinuous replaces the swooping, when the writer zooms giddy fast from empirics to theory and back. Moving across registers demands significant care and skill. Of course, our conversations ranged much more widely than this short summary can convey. read more Writing Place in the Environmental Humanities: Five Ideas – Edinburgh Environmental Humanities NetworkEdinburgh Environmental Humanities Network. This talk deals with four lures proffered by the Anthropocene. The first three: hyper-modernisation, or the colonisation of deep time by the anthropos; apocalypse therapy, or melancholic revelry in the end times; the significance sky hook, or “cfp: X in the Anthropocene”. These three are lures to be avoided. I then note a latent underspecified tendency shared by many – from progressive policy folk to biophilosophers – to invoke gardening as metaphor for planetary ethics. Drawing on my research into real and imaginary gardens, I outline something of what such an ethic might partake: anticipating life with vegetal philosophy; domesticating decomposition and death; flourishing awkwardly while fighting wars against the enemy. These take us to a final, more attractive lure. Beginning from nomadic points of difference, we might glimpse beyond the Anthropocene the utopian lure of new collectives and new kinds of humans, composed for more sanity and for feeling more deeply the earth and all its knotty difficulties. The Turin Horse (2:14:12). Directed by Béla Tarr. Copyright TT Filmmûhely. Whether as fossil fuels, domesticated crops, weedy foot-soldiers of Empire, habitat for endangered species, cosmopolitan globalisers from below, carbon sinks, or indicators of climatic change, plants have been significant players in cultivating the ecologies of the Anthropocene. Cultivation, like domestication, is often narrated as the taming or appropriation of the wild through human practices of control, selection, categorisation, exploitation, privatisation, breeding, and tending. The consolidating field of plant geographies have shown the power of plants to exceed and subvert such narratives, as well as beginning to scrutinize the ties of labour, disease, affect and violence that bind human and plant communities. New plant science, meanwhile, has also demonstrated plants to be communicative, adaptive beings with a hitherto under-appreciated phenotypic plasticity. This has provoked sustained meditations on the challenges to received notions of personhood, ethics and vitality posed by vegetal life. Finally, if plants and their cultivation have led us into the Anthropocene, it remains to be seen how better ways to live after the Anthropocene might take root out of new ecologies of cultivation. Topics could include critical geographies of horticulture, agriculture, silviculture, ecological restoration, rewilding, post-industrial ecologies, landscape management, botany, and gardening. We particularly welcome papers that combine empirical fecundity with theoretical speculation. Please send abstracts of 200 words or less to franklin.ginn@ed.ac.uk and stephanie.lavau@plymouth.ac.uk by 18 February 2015. Marder, M. 2013. Plant thinking: A philosophy of vegetal life. New York: Columbia University Press. Hall, M. 2009. Plants as persons: A philosophical botany. SUNY. Head, L., J. Atchison and C. Phillips. 2014. The Distinctive Capacities of Plants: Re-Thinking Difference Via Invasive Species. Transactions of the Institute of British Geographers.